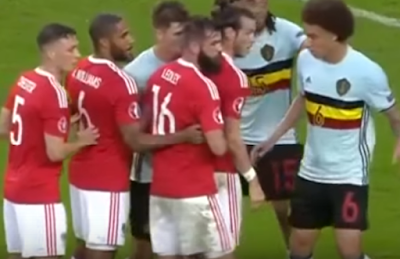 What about that "hold-up-and-turn" play from Robson-Kanu? It's my favourite goal so far in this tournament, simply because of how unexpected and important it was in the circumstances. And what about the Welsh tactic deployed during their set pieces off corner kicks? That trick involves 4 players lining-up, huddled together almost single-filed and then dispersing into 4 (seemingly) random different directions as the ball is kicked from the corner flag. According to my dad, this is a common tactic used in AFL games - called a clusterbomb or "Clarkson's cluster" - deployed with great effect by Hawthorn in 2008. I've not really seen this tactic in football?!?! It's pretty funny to watch, as the strategem causes mass confusion from the defending team's point of view. It requires the players to clump together at the outset. And if you try to separate them before the corner kick is taken, they will not budge. The Belgians tried that. They will just stand there like buffalo. Wales will miss Ramsey who was fantastic tonight - he's suspended from the semi-final against Portugal. I hope they upset Portugal, I really do.